5/4/2016 - Germany is in a solid economic position, but ageing and technological change require new investments in people to ensure a stronger and more inclusive society, according to the latest OECD Economic Survey of Germany. 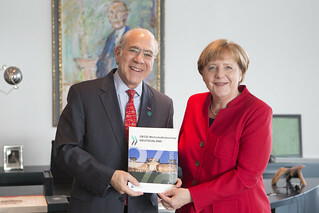 The Survey, presented in Berlin today by OECD Secretary-General Angel Gurría, highlights Germany’s robust recovery and high levels of competitiveness since the global economic crisis. It also points out the wide range of challenges facing the country as it seeks to strengthen productivity, boost well-being in a rapidly ageing society and ensure the integration of newly-arrived migrants. More investment will be key to raise productivity and living standards. Fostering investment in knowledge-based capital and unleashing the potential of key services would also strengthen the competitiveness of manufacturing, facilitating the transition to “Industry 4.0.” Investing in key education, the lifelong skills development of German employees, on social services as well as boosting public investment in poor municipalities would also enhance inclusive growth, according to the Survey. There is scope to improve efficiency in identifying and implementing municipal investment projects. Steps to eliminate regulatory biases that hold back the reallocation of resources would boost productivity and investment. The Survey points out that there is particular scope to raise productivity in services through regulatory reform. Improving governance or further privatising government stakes in important businesses would also help. The Survey underlines that effective integration policies for the newly arrived immigrants will be critical for Germany to improve economic outcomes and ensure social cohesion. This requires up-front spending on training and language skills. Giving access to the labour market more quickly to all refugees who are likely to stay and boosting active labour market programmes will also be necessary. Germany has implemented far-reaching labour market reforms in the past, but it can do more to eliminate the barriers for women to develop their professional careers, which would boost well-being and incomes substantially. This should include greater investment in childcare, early childhood education and full-day schooling, and lowering the high tax burden on household’s second earners that discourages many women from working full-time. The introduction of a separate tax-free allowance for second earners would improve incentives to work. Indexing the statutory retirement age would improve the sustainability of the pension system, the Survey says. As the retirement age needs to go up, coverage of disability risks could be improved. There is also scope for further reforms to remove barriers to employment - and well-being - of older workers. Barriers for older workers to combine pension receipt with employment can be removed and the prevention of health risks at higher age could become more effective. An Overview of the Economic Survey, with the main conclusions, is freely accessible on the OECD’s web site at: http://www.oecd.org/germany/economic-survey-germany.htm. Journalists are invited to include this Internet link in reports on the Survey. For further information on the Economic Survey of Germany, please contact Matthias Rumpf, media officer in the OECD Berlin Centre (+49-30-2888-3549), or the OECD Media Office (+33 1 4524 9700).